How do you order Thyroid 30 mg online? 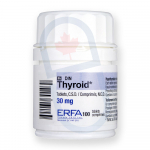 You can order Thyroid 30 mg online from YouDrugstore, an online Canadian pharmacy. 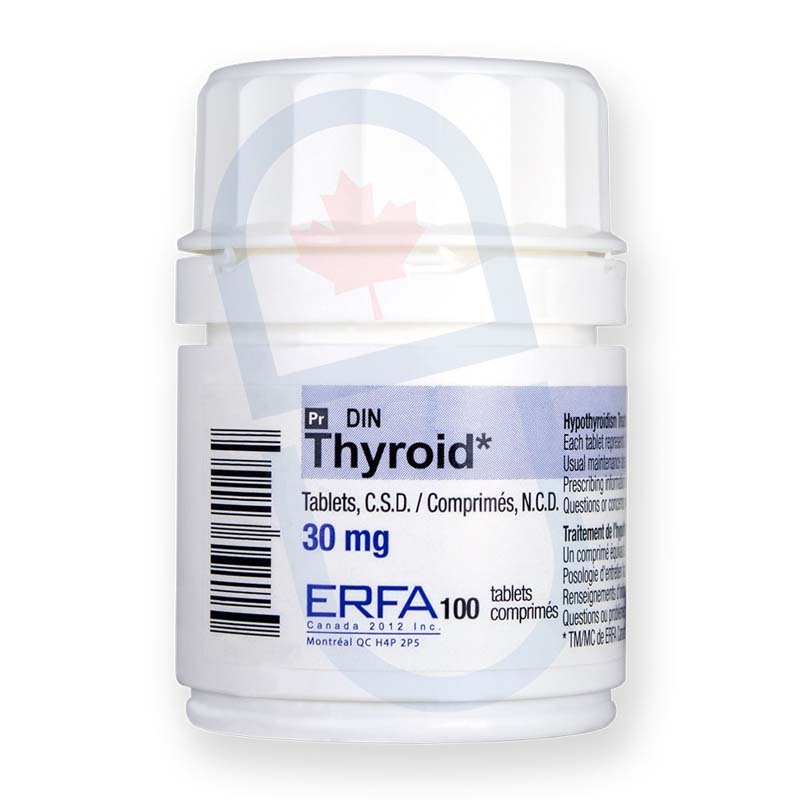 Purchase Thyroid 30 mg from us and pay the same price they pay in Canada. Thyroid is an alternative to Armour Thyroid. All you have to do is register on our site and send YouDrugstore your prescription for our professional health care team to review. You can even ask your doctor to fax us your prescription directly. YouDrugstore will then ship your order directly to your mailbox for a cheap shipping cost. All orders under $100 cost only $15 for shipping. All orders over $100 come with free shipping. Order Thyroid 30 mg from YouDrugstore today and start treating your hypothyroidism. What are the side effects of taking Thyroid 30 mg? You should always understand the possible side effects of taking the medications you are prescribed. Fortunately, side effects are usually rare when taking Thyroid 30 mg. However, side effects that you could possibly experience can include diarrhea, tremors, sudden weight loss, vomiting, chest pain, changes in menstrual cycles, and shortness of breath. If you do experience these side effects, contact your doctor immediately. Although rare, when these side effects actually do occur they typically mean that your dosage simply needs to be adjusted. If you have any concerns or any questions speak to your doctor. Who might receive a prescription for Thyroid 30 mg from their doctor? People who suffer from trouble with their thyroids may be prescribed Thyroid 30 mg. If you have been prescribed Thyroid 30 mg by your doctor, it is most likely to treat hypothyroidism. Hypothyroidism is essentially when your thyroid gland does not adequately provide your body with enough thyroid hormone. They also call it an 'under active' thyroid. Why does that matter? The thyroid hormones affect almost every cell in your body. They manage your metabolism and direct how hard each cell in your body works. Symptoms of hypothyroidism can include poor memory, difficulty focusing, unexplained weight gain, fever, changes in appetite, and shortness of breath. Ask your doctor to check your thyroid if you are currently dealing with symptoms like these. Why is Thyroid 30 mg prescribed to treat hypothyroidism? As mentioned above, hypothyroidism is essentially when your body can not produce enough thyroid hormone on its own. Thyroid 30 mg is made with desiccated thyroid, which is thyroid extract. When this enters your body it provides the missing thyroid hormone which your body can then use to tell the cells in your body to work at their an appropriate pace. Thyroid 30 mg is also made with porcine thyroid powder, which is a combination of other necessary thyroid hormones that your body needs. Thyroid 30 mg is also prescribed because it is the generic version and alternative to Armour Thyroid tablets. Order Thyroid 30 mg today from YouDrugstore and help treat your hypothyroidism. When should you take Thyroid 30 mg? Your doctor will most likely tell you to take Thyroid 30 mg daily. He will tell you exactly how many pills to take. Treatments are all based on individual needs, so your dosage and how your doctor asks you to take Thyroid 30 mg may be different from others you may know who take Thyroid 30 mg. You should avoid taking Thyroid 30 mg if you suffer from thyrotoxicosis or adrenal cortical insufficiency. Finally, you should always take Thyroid 30 mg exactly as your doctor has directed. Your thyroid is a part of your endocrine system. It is a large gland that is found near the bottom of your neck. Its task is to properly and efficiently direct how your body uses its energy. It aids in producing essential proteins for your body, as well. Why is the thyroid gland important? Because the thyroid gland produces the thyroid hormones, and they control the productivity of nearly every cell in your body. Where can I learn more about Thyroid 30 mg?